Pour cette troisième journée, les fortunes ont été diverses parmi les rikishi. Le yokozuna a eu l’air de souffrir du dos en se redressant et il faudra peut-être surveiller son état de santé dans les jours qui viennent. Kakuryû ne s’est pas embarrassé de manières, et a projeté à terre Ikioi en profitant de son attaque. Juste avant lui, le grand champion Hakuhô a déployé toute sa science pour projeter à terre le colosse brésilien Kaisei, qui malgré tous ses efforts, n’a pas vraiment réussi à inquiéter son antagoniste. Les trois yokozuna sont donc toujours invaincus et dans la course au yushô. 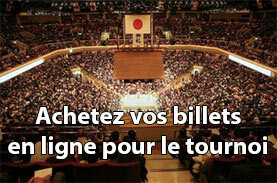 Du côté des ôzeki, si Takayasu et Goeidô se sont imposés respectivement devant Chitorairyu et Ichinojo, la partie a été bien différente pour Tochinoshin. Le géorgien n’a pas démarré tambour battant comme d’habitude et le jeune komusubi Takakeisho, après une charge furieuse, a réussi à éviter le contre de l’ôzeki en l’accompagnant vers le sol ; Tochinoshin finit allongé à terre, incapable de retenir son élan. 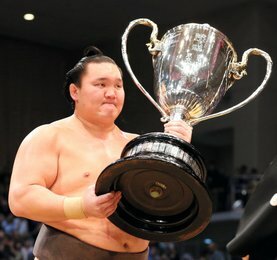 A noter l’invincibilité de 6 lutteurs en plus des yokozuna et de l’ôzeki Takayasu: Mitakeumi, Asanoyama, Hokutofuji, de l’ancien ôzeki Kotoshogiku, de Nishigiki et de Yoshikaze. Yokozuna Kisenosato secured a third consecutive victory in his first meet back from injury on Tuesday, as most of the elite wrestlers in the top division maintained spotless records at the Autumn Grand Sumo Tournament. 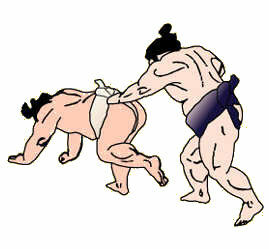 In the day’s final bout at Ryogoku Kokugikan, Kisenosato braved a flurry of slaps from maegashira No. 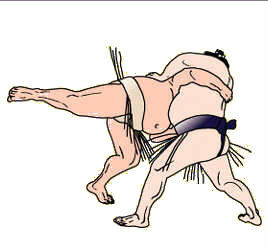 2 Yutakayama (0-3) and drove his opponent to the straw on the third day of the 15-day tournament. 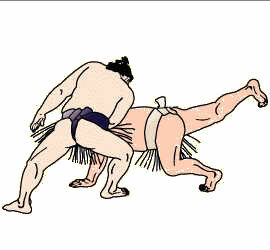 But Yutakayama did not relent, as the pair, fighting for the first time, locked arms and battled to gain the upper hand. 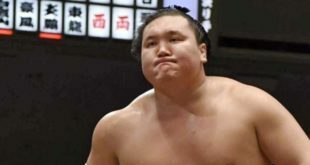 After a brief pause, Yutakayama looked set to earn his first win against a grand champion when he drove the yokozuna to edge of the ring, but Kisenosato dug in and twisted Yutakayama down while falling to the clay himself. The referees were called out to debate the outcome and eventually awarded the match to the dogged grand champion. Kisenosato, the first Japanese-born wrestler in 19 years to gain promotion to sumo’s highest rank, is fighting for his career after missing a record eight-straight meets due to a lingering muscle injury in his left chest. Mongolian yokozuna Kakuryu and Hakuho also picked up wins, defeating top-ranked maegashira Ikioi (0-3) and Kaisei (1-2), respectively. All three yokozuna are competing together for the first time since January. 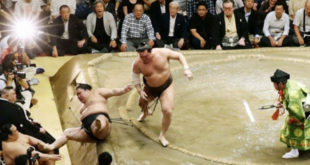 Kakuryu, who withdrew from the July meet where he had been seeking a threepeat, survived a solid effort from Ikioi, who has won five “kinboshi” awards for defeating a yokozuna. 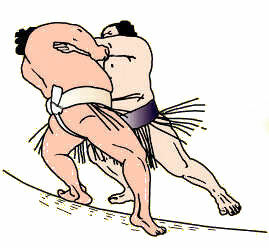 Kakuryu slipped to the side as the winless maegashira attempted a final shove and thrust Ikioi down to the clay. 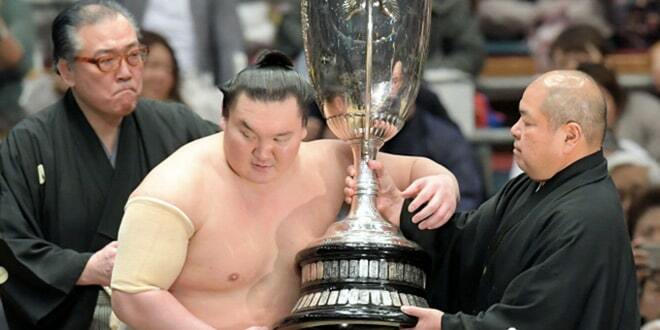 Hakuho, still looking for a record-extending 41st makuuchi division title, fought for a solid belt-hold on the Brazilian-born Kaisei and eventually turned him around and down with a strong under-arm throw. 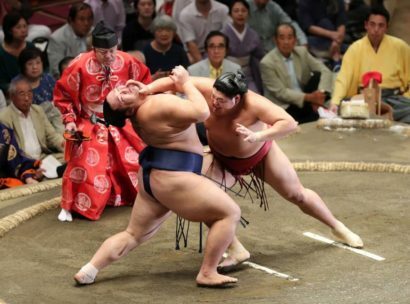 After a simultaneous fall was deemed too close to call, a rematch between defending champion Mitakeumi (3-0) and komusubi Tamawashi (0-3) went in favor of the sekiwake. Mitakeumi, gunning for an ozeki promotion and a second straight top division title, took the force of Tamawashi’s initial charge and tried to push back, but changed tack for a quick slap-down win. Takakeisho (1-2) caused the upset of the night, beating ozeki Tochinoshin (2-1) for his first win of the tournament. 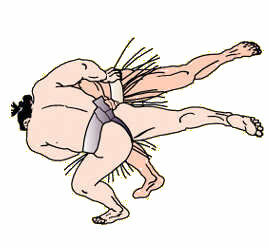 The spry komusubi blasted inside the powerful Georgian’s reach, found his left arm and pulled Tochinoshin down to his first loss. “I think it went okay, I’m pretty happy. 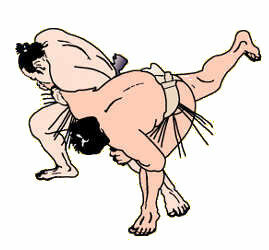 I was watching his body and aware of my own,” said Takakeisho, fighting as a komusubi for the first time since January. “It’s the first time I’ve returned (to the rank) so I’ll try hard to do better. If I fight in my style, I think it should be okay,” Takakeisho said. 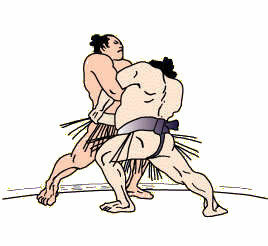 Ozeki Goeido (2-1) charged in fast against sekiwake Ichinojo (1-2), turning the 227-kilogram Mongolian to his side by the belt and deftly pushing the big man out for the win. The two wrestlers are now tied after 16 career matchups. 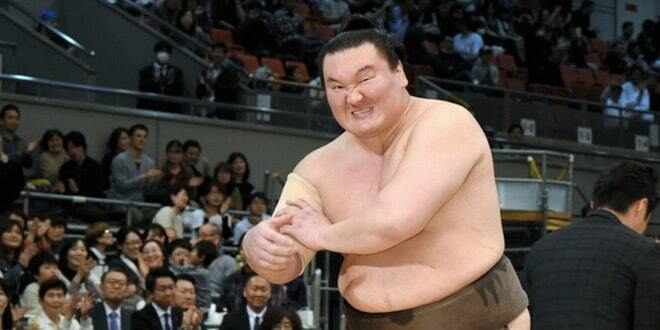 Ozeki Takayasu (3-0) held on for a win against Chiyotairyu (0-3). The No. 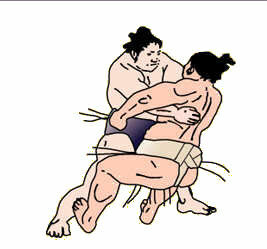 2 maegashira drove Takayasu to the straw and tried to thrust the ozeki out, but Takayasu brought down a powerful left-handed shove as he twisted out of harm’s way and slapped his opponent out. Among the rank-and-file wrestlers, No. 5 Asanoyama, No. 8 Kotoshogiku, No. 9 Hokutofuji, No. 12 Nishikigi, and No. 15 Yoshikaze all maintained perfect records. Fan-favorite Endo remained winless after narrowly losing to No. 3 Shodai (1-2), while No. 11 Kyokutaisei (1-2) earned his first win but left the ring limping after injuring his right knee in a bout against No. 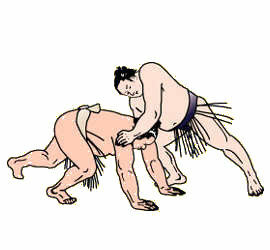 10 Daieisho (1-2). No. 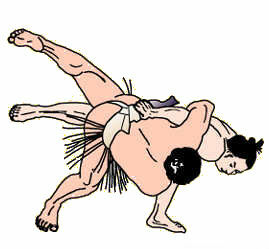 14 Takanosho (1-2), who made a winning makuuchi division debut on Sunday, was thrust down by No. 15 Chiyoshoma (2-1) for his second straight defeat. Suivant J4 – Enfin une victoire pour Endo ! Les San’yaku sont en formes…ça promet ! Et pourquoi pas des playoffs…ça fait un moment qu’on en a pas vu, surtout à plusieurs lutteurs.